YOUR GUTTERS ARE ONE OF THE MOST IMPORTANT AREAS OF YOUR ROOFING SYSTEM. 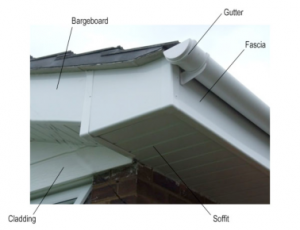 Many people don’t actually realise just how important their guttering is, but not maintaining it could actually leave you with a whole host of problems. Leaks in the home can often be attributed to blocked gutters, and allowing gutters to get blocked and to overflow can seriously damage your property’s brickwork and pointing. We use a wide range of UPVC and PVC products that can help to transform the exterior of your home, making it much more attractive. Whether you simply want to get your home in order or you are thinking of selling your property, we can help. Not only this, but we can even refurbish wooden building materials that are beginning to show signs of wear and tear, such as bargeboards, cladding and soffits, thanks to our extensive experience in the industry. If you currently have wooden exteriors that you would like to replace, we can also handle this for you. We will ensure that all wooden items are primed and painted in a colour of your choice beforehand, and we will also make sure that they are fully weatherproof. To find out more about our services or to apply for a quote, get in touch today.